Gambrel Cabin with coveted open great room floor plan, amazing vaulted wood ceilings, a wood stove on an elevated brick hearth and a spacious open loft with distant mountain views. Nearly half a century ago the craftsman who built this beauty took great care in placing it perfectly to maximize passive solar heating, saving lots on heating costs. A wall of south facing windows in the living room, topped with a rake style crown creates a big screen to watch the most beautiful sunsets, followed by a night of star gazing. The main level includes two bedrooms and a full bath room. Upstairs is a large loft area with two dormer alcoves, including a laundry nook and a second nook ...space for an office, closet or half bath? 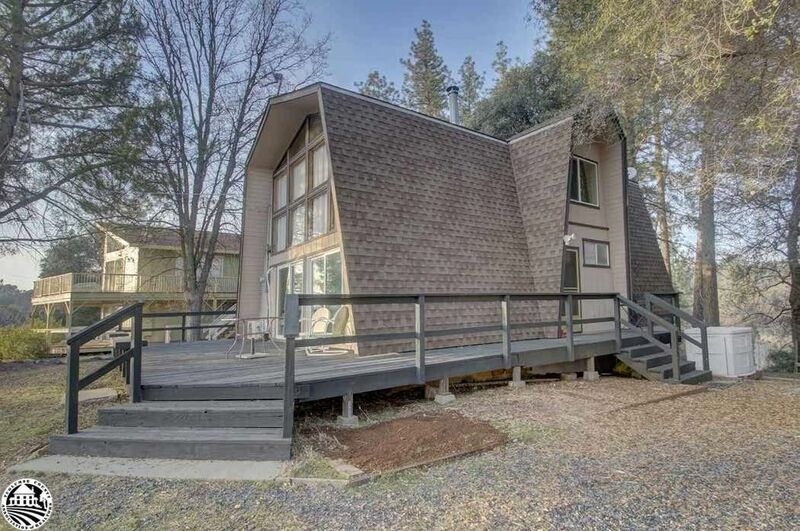 The owner has gone to great lengths to keep the classic cabin appeal, while adding many dual pane windows, new flooring, a wall heating and air unit, interior and exterior paint, a new bathroom vanity, and high speed internet for a home based business. The rare level parcel has lots of off street parking with room to park a boat or RV in the rear. It is located on a quiet circle that lends itself to leisure walks and bike rides. Situated in the gated resort community of Pine Mountain Lake; 18 hole pga rated golf course, hiking trails, recreational lake, swimming pool, tennis and pickle ball, archery, equestrian center and more. All just 26 miles from the west gate of Yosemite National Park.